Plan a Day of the Dead party in honor of the traditional Mexican holiday, Dia de los Muertos. At PartyCheap you can find everything you need to throw a great Day of the Dead Party and remember deceased family, friends, and ancestors. 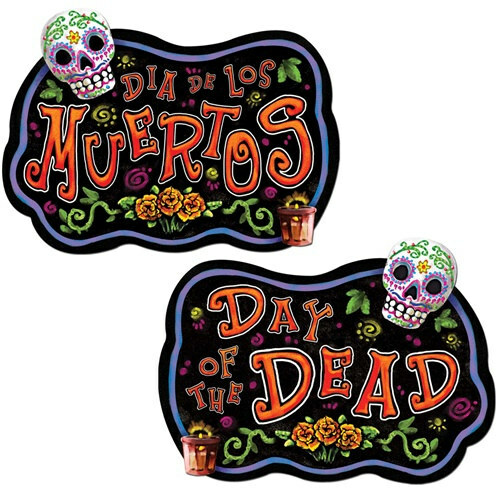 Our Day of the Dead decorations come in a variety of colorful and authentic styles including our Day of the Dead cutouts and our Skull Tea Light Holder. We also offer a variety of Day of the Dead masks that you can wear at your next big party! Some of our Dia de los Muertos decorations are made of an all-weather material so they can be used both indoors and outdoors! With proper care, all of our PartyCheap products can be used year after year for a variety of parties and events. Our Day of the Dead party supplies are no different! Regardless of your Day of the Dead decoration needs, PartyCheap is here to help! We also offer bulk discounts to meet every party budget! If you aren't familiar with the Day of the Dead, it is a celebration to honor deceased relatives. It is typically celebrated on November 1st and 2nd of every year. Events are held at cemeteries and homes with an attempt to communicate with passed loved ones. Stories are told remembering family members and the overall spirit is meant to be uplifting and on a positive note. Skulls and skeleton decorations are used as Day of the Dead decorations along with flowers, candy, toys, and alcohol. Often shrines are built with pictures and tokens of the deceased in an effort to honor and remember them. This celebration originated in Mexico hundreds of years ago and lasted a period of weeks. In modern-day Mexico, Day of the Dead actually takes place over a period of days, from October 28 to November 2. Hang a few Day of the Dead Signs with “Dia de los Muertos” on one side, and “Day of the Dead” on the reverse. For more hanging decorations, you can purchase Day of the Dead Whirls and Day of the Dead Stringers to hang from the ceiling. Traditionally, people would create a tiny altar on a set of stairs or on a table to commemorate a deceased family member. This Day of the Dead altar prop recreates this very traditional look. Remember, a Day of the Dead celebration is paying homage to your past friends and family. It is a celebration of their life, and not a morbid event. Keep it upbeat by celebrating what they loved. And always remember, regardless of your Day of the Dead party supply needs, when you party with PartyCheap, we’re sure to have exactly what you’re looking for! Now that you have some background information on Day of the Dead, it's time to start planning your celebration and deciding on some decorations. No matter if you are having a large party or gathering or just want to decorate your house, office or classroom, we have the decorations you need. The day of the dead scene setter is a great way to start decorating it hangs on the wall and is a great way to bring the room to life for the occasion. Next use a hanging banner to hang up in the room you plan to decorate, you can use this to hang on one wall or use around the entire room. Finally the skull tea light holders and place them around the room, even if you don't put a tea light in them they still make for a great decoration.